Famous for its floating islands of reed on sacred lake, Rewalsar District has strong Buddhist connections apart from its relations with Hinduism and Sikhism. Three famous Buddhist monasteries including Debung Kagyud Gompa, Tso-Pema Ogyen Heru-kai Nyingmapa Gompa and Zigar Gompa dot the serene landscape. According to Buddhist beliefs, Indian monk Padmasambhava, departed from Rewalsar to spread Buddhism to Tibet. Also, the Buddha Cave on the ridge area is believed to be the meditation spot for Padmasambhava Monk. The oldest and the largest monastic complex at Tabo in Spiti Valley form an important backdrop of Buddhism in the state. Prevalently known as Chos Khor Monastery, Tabo has significantly contributed to the Indo-Tibetan collaboration in propagating the religion to the Himachal region. While visiting Dharamshala, it feels like one has visited to a country dwelled by Tibetans. But the soul and the soil are truly welcoming. Located in Western Himachal region, Dharamshala is a prominent name in Buddhist tour to the state, as the home of Dalai Lama and all the Tibetans in exile. It is a well-known centre for studying Buddhism, its sutras, tantras, and major texts related to this. And now it has emerged as one of the major visited sites in Himachal Pradesh attracting scholars, pilgrims and tourists alike. In the upper Dharamshala, Mcleodganj is the actual residence of His Holiness the Dalai Lama. The famous monastery known as Namgyal Gompa has larger than life images of the Buddha, Padmasambhava and Avalokiteshwara along with the golden prayer wheels. In order to understand the culture of residents at Dharamshala, a visit to Tibetan Institute of Performing Arts is a must do activity in the region. The monastic compound in Nako enshrines the legendary footprints of the Guru Padamsambhava at the Lotsabaage Monastery. This 3660 metre high altitude village in Kinnaur is located near a clear lake also known as Nako. The temples in Nako Complex are considered the oldest and preserve the original clay sculptures, murals and ceiling panels. The oldest monument devoted to the Great Translator Guru Padmasambhava serves as the main temple in the valley. Other structures in complex consist of a Small White Temple important for portraying the important scenes from the Life of the Buddha on the wooden door frame. Famously known as Guru Ghantal Monastery, Gandhola Gompa was also founded by Guru Padmasambhava 800 years ago. One of the renowned Buddhist structures in the state, Guru Ghantaal Monastery still preserves the wooden structure with pyramidal roofs, wood carving and the idols of Padmasambhava & Brajeshwari Devi. During a full moon night in mid June, the monastery comes back to its full fervour with Ghantaal Festival, celebrated by Lamas and Thakurs together. 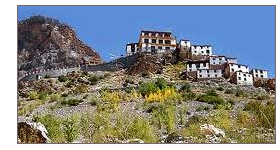 Termed as the land of the gods, Lhalung Monastery was one of the earliest gompas of Spiti region. Also known as Golden Temple, Lhalung was modeled on the lines of Tabo monastery as a place for learning and still continues to be the one among them. Built in 12th century, Kardang Gompa is the most important monastery in Lahaul region of the state. Once the capital of Lahaul, Kardang now has a huge monastery painted in white and bedecked with prayer flags. The library in Kardang also preserves volumes of Buddhist scriptures in Bhoti. Just as its name suggests, Dhankar Gompa stands tall on a cliff in the Central Spiti region. Converted as a monastery from an ancient prison, Dhankar Monastery is a dwelling place for 100 Lamas and preserves Buddhist scriptures in Bhoti language. The worshipped deity includes the statue of Vairochana  Buddha in meditation form as four complete figures seated back to back. Shashur Gompa is located amidst the patches of blue-pines in Lahaul and Spiti region. The monastery was built in 17th century by Lama Deva Gyatsho of Zanskar, a missionary of the king of Bhutan. The Buddhist heritage in the monastery includes large Thangka paintings and wall paintings representing the history of 84 Buddhas. The biggest and the oldest monastery of the Spiti Valley, Key Gompa also serves as a religious training center for the Lamas. The monastery was in news in year 2000, as the site of Kalchakra ceremony under the aegis of His Highness Dalai Lama. The complex features beautiful scriptures and paintings of Buddha. Lamas practice dance, sing and play on pipes and horns in this exquisite monastery. 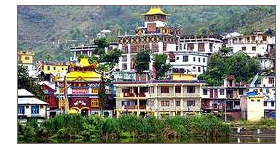 The tourist spot of Kullu has its links with Buddhism. The travel accounts of the Chinese pilgrim monk Hiuen Tsang state that the region is completely surrounded by mountains, containing a Stupa built by Emperor Ashoka where Buddha preached. Recent archaeological evidences of institutional Buddhism are found in Kangra District including Tikka Tambarhar in Pathiyar, Uparali Dari at Kanhiara, Lakhamandal and Chetru in the upper Kangra region.